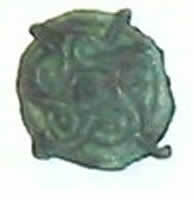 This is an early Saxon bronze brooch found by a member of the West Sussex Metal Detecting Society. It has a lovely swirling pattern and would have been very beautiful when fully polished. The Saxons were the first people to settle in the exact place we now know as Steyning. Previous settlements appear to have been higher up on the Downs.